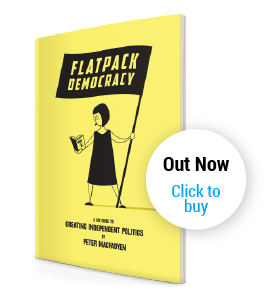 When setting out to democratically take over your local council (and mentioned endlessly in Flatpack Democracy) all the important rules and advice – such as how to register a ‘minor party’ – are to be found on the Electoral Commissions website. It has a sister site About My Vote which gives information to the individual how to register to vote etc etc. None of the above are related to the interesting and important Electoral Reform Society which campaigns for a better democracy. We go on about the Localism Act and the effects it could have for more dynamic and meaningful councils. You can download a .pdf outlining the main points in ‘plain English’ – a least that’s what it says on the packet. The Isle of Wight Independent group created and published an excellent Framework for Change that is the equivalent of Frome’s Ways of Working and Principles rolled into one.